Viviana Heger is Of Counsel at Meyers Nave in the firm’s Land Use and Environmental Law Practice Group. She has more than 15 years of experience assisting clients with matters involving air quality, water quality, hazardous waste and materials management and disposal, greenhouse gas emissions, remediation, failure-to-warn under Prop 65, and chemicals regulations such as TSCA and California’s Green Chemistry Initiative. Viviana also has a strong background in real estate, land use, and commercial and industrial development. 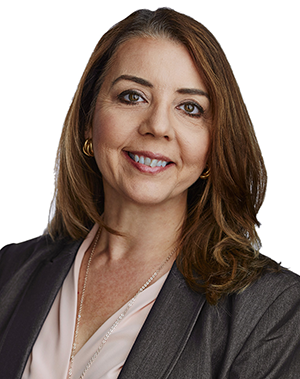 Viviana has extensive experience advising and defending clients in complex environmental regulatory matters, including compliance counseling, administrative petitions and appeals, defense in enforcement, and procurement of permits. Based on years of comprehensive expertise, she quickly identifies practical and effective regulatory strategies that clients can implement to help eliminate or minimize potential liabilities. Her experience also includes advising on health, safety and emergency management plans. Viviana has assisted clients with contested and non-contested permitting matters in both formal and informal proceeding with state and local regulatory agencies including the South Coast Air Quality Management District and other air districts, California Department of Toxic Substances Control, and regional water quality control boards. She has also litigated claims involving property damage, toxic torts, and environmental citizen suits. Viviana’s unique background includes nearly 10 years in the legal department of a global petrochemical company where she handled environmental compliance and litigation matters relating to marketing, manufacturing and distribution operations. In addition to analyzing state and federal environmental claim liabilities, Viviana compiled the company’s compliance manual that covered federal laws and laws of numerous states. Prior to private practice, Viviana served as a part-time judicial extern for the Honorable A. Howard Matz. She researched and prepared memos recommending outcomes on motions to dismiss, reviewed new cases for jurisdictional deficiencies, and drafted court orders. Utilized new regulatory scheme to challenge enforcement of clean-up and abatement order (“CAO”), securing favorable results in judicial review. Defeated virtually all arguments in motions to dismiss a federal Comprehensive Environmental Recovery, Compensation, and Liability Act and Resource Conservation and Recovery Act matter involving multiple PRPs, thereby preserving and enhancing ability of cost recovery for clean-up costs incurred since 2014. Advised and implemented multi-phase warning protocol for emissions associated with portable diesel-powered back-up generators, shielding client from frivolous Proposition 65 litigation. Settled for a de minimis amount various historical air quality violations for a manufacturing facility operating without a modified air permit and secured Emission Reduction Credits valued at up to $1.2 million; in-house counsel reported “better-than-expected” results on Association of Corporate Counsel webpage (acc.com). Developed a recycling strategy to avoid all hazardous waste disposal costs, saving a manufacturing facility about $200,000 in disposal fees; developed a compliance plan for underground piping that ensured timely permitting and allowed client’s project to remain profitable and on track. Successfully rescinded an imminent and substantial endangerment order from the Department of Toxic Substances Control and negotiated consent agreement that coordinated other potential responsible party contribution toward remediation of co-mingled plume contaminants at active manufacturing facility. Developed and implemented strategy that successfully secured insurance coverage to fund remediation of co- mingled plume contamination despite narrow eligibility under environmental insurance policy. Negotiated reasonable terms and conditions of an individual National Pollutant Discharge Elimination System permit and Time Schedule Order that significantly reduced monitoring and other responsibilities imposed on industrial discharger, while appealing certain limits under the Total Maximum Daily Load program. Strategically filed appeal and variance petitions with the South Coast Air Quality Management District in a way that secured within weeks dozens of permit revisions that had been pending for several years, thereby eliminating violations for operating contrary to the permit. Eliminated all South Coast Air Quality Management District notice of violation penalties associated with historical permit exceedances and settled remaining violations for a de minimis amount, after obtaining and using public records to demonstrate that the agency inspector was misinterpreting the facility permit. Succeeded in dozens of matters to obtain variances to temporarily suspend application of local air quality rules and permit conditions at administrative hearings before the South Coast Air Quality Management District hearing board for various oil company and industrial clients. Resolved enforcement matters for several manufacturing facilities involving allegations of hazardous waste mismanagement by the Department of Toxic Substances Control and local implementing agencies, avoiding significant penalties and fines. Resolved litigation against a small metal finishing facility that had failed to properly characterize and disposed of metal-bearing dusts as hazardous waste. Assisted in successful certification of environmental impact report for expansion of a northern California refinery, including the development and implementation of mitigation measures for greenhouse gases. Secured CEQA notice of exemption for a tank installation by a gasoline terminal facility operating on land owned by the California Public Utilities Commission, satisfying both CPUC and CEQA requirements and avoiding exhaustive CPUC environmental review that otherwise would have been required.